Subscriber magnets (sometimes called reader magnets) are a fabulous way to build your newsletter list and ultimately sell more books. For basic information about this marketing tool, we have a detailed post explaining more about these magnets and how they work, but if you just need help putting up your own subscriber magnet on Book Cave, this tutorial will walk you through it step-by-step. To add your magnet, log in to Book Cave and go to the My Magnets menu option under the Account drop down menu. If you don't have these options, you are probably signed up as a reader, not an author, and the easiest way to rectify that is to submit your magnet book or other books to our site (which automatically changes you to an author), and then follow these steps. To add a magnet, click the button Create Magnet at the bottom right of the page. If books pop up here, it means you've already added them to your dashboard at some point (either for a retailer promotion or for a permanent listing on our sister site My Book Ratings). 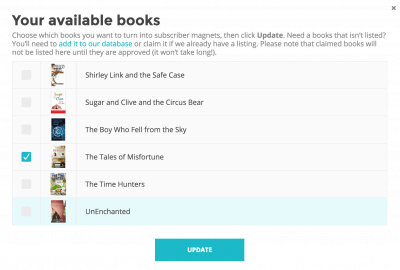 Select the books that you want as subscriber magnets and click Update. If no books pop up, or you don't see the one you’re looking for, please follow the on-screen instructions to submit it to our database. Or you can use this portal to add a book. Using this link will add a book to your dashboard, which you can later use as a subscriber magnet. If the book is a full book available for sale on retailers, it will also be posted on My Book Ratings, and you will be able to submit it at a time of your choice for a retail promotion through your dashboard. Once you choose the book, it will appear on your Subscriber Magnet page. 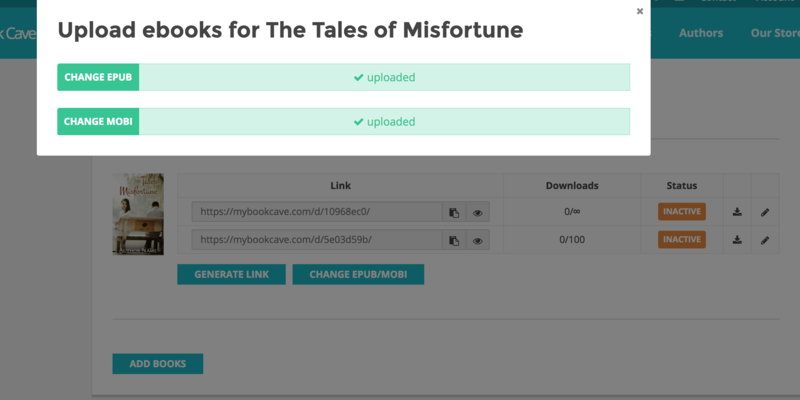 Click Upload EUPB/MOBI buttons to upload EPUB and MOBI files of your ebook, then click the Generate Link button. A window will pop up where you can edit book information. Please note that the link URL is automatically generated and cannot be edited. You can, though, put in a label for your magnet (so if you're using it in your newsletter, or as part of a group promotion, you can label it accordingly to help you keep track of each link), and you can put in an alternate book title (so on one link, you can put in the title and something like "award-winning romance" while on another link, you can just leave the title). You can also choose whether or not the link is public. By default, your link is not public, but if you make it public, readers will be able to find the book by browsing our new Book Cave Direct page (coming soon!). You can choose whether or not to require an email from readers who download your book (if you're giving the book to readers who are already subscribers or are giving it in exchange for a review, you would not require an email, but otherwise, you would require an email). You can also put in an expiration date for your link, mark the link active or inactive, set a number-of-downloads limit for that link, and edit the book teaser. When a link expires or is marked inactive, readers who go to the link will be informed that the link is no longer valid. You can decide to re-activate a link at any time. If you want to give a sample, make sure to submit the book specifically as a sample when you add it to your dashboard. Doing so will add the sample text to the page. If you have the full book on your dashboard already, but you want to give a sample of that same book as a subscriber magnet, you'll need to submit it again, as a separate book. In the end, you'll have the book twice on your dashboard: the full-length book will be under the "Books" tab, and the sample will be under the "Previews and Samples" tag. Push the Update button at the bottom when you're finished, and you'll see that the Generate Link button is still there. This is because you can generate multiple links per book and distribute them in different ways. Say you want to use your book as a subscriber magnet AND as a gift to those who are already signed up for your newsletter. You can generate two links: one that requires an email for new contacts, and another link for your existing subscribers that doesn’t require them to put in their email. Or say you are doing promotions with two different groups and want to track which one does better. Simply create the links you need. Once you've set up a link, you can always go back and edit the information connected to it (blurb, files, etc.) by clicking the pencil icon next to the link. If you want to view the end-user subscriber magnet page, click on the magnet link. Note that you can change the link address to a label if you want (i.e. Email Required, For Current Subscribers, For romance promo—or whatever you want to help you remember what you created that link for). When readers navigate to the link to your subscriber magnet, they will be prompted to put in their email address (if your set your link to require one) to receive the book. Once they do, we'll send them an email with an exclusive link to the download page. Your free book CAN ONLY be accessed by clicking on that link through the email, so readers can't share the URL with other people and have it work. If you haven't required an email address, readers will download right from that first page. 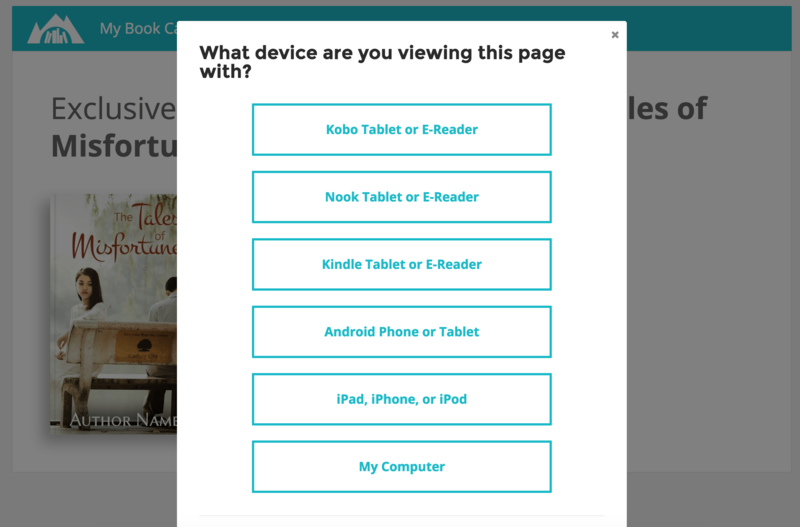 Once on the download page, our website will walk your readers through downloading your book onto their selected devices, so you don't need to worry about explaining how to get the book. Book Cave collects all email addresses submitted. You can choose to integrate your each magnet book with MailChimp and MailerLite or download them yourself. To integrate, go to the preference link on your account menu, and choose the Integrations tab. Then go to each magnet book, click on the edit button, and choose which of your newsletters lists to send the subscribers of that book to. The emails will automatically be sent to your email program every night. To download emails yourself, navigate to the Subscriber Magnets menu again and find the book and link you want to download emails from. Click on the download icon next to the link. You can then choose from a range of options which emails you want to download. You can download them by date range or by new (those you have not yet downloaded). The options can be further broken up by those that have or have not confirmed their email on Book Cave (confirmed emails are emails that have been used to download your book). You should download all emails, both confirmed and unconfirmed. You'll notice there is also a menu item for group magnets. On your dashboard, you can either join or create a group promotion with other authors. Also, make sure to join the Book Cave Promotions Page for Subscriber Magnets to participate in group promotions that will bring you more subscribers! 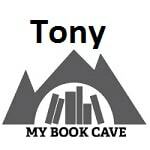 If you'd like to learn more about what Book Cave can do for you, please enter your email below and click the "Learn More" button. And that's it! Have a great time finding more subscribers for your newsletter. If you'd like to find other Subscriber Magnet related posts, please click here. And as always, let us know if you have questions by posting a comment below. I'm having an issue right now where I can't create a new magnet for a book that is already in a magnet. When I click "Create Magnet", it doesn't list the book as an option. Any help would be appreciated, thanks! That's correct, you can only have one magnet per book. 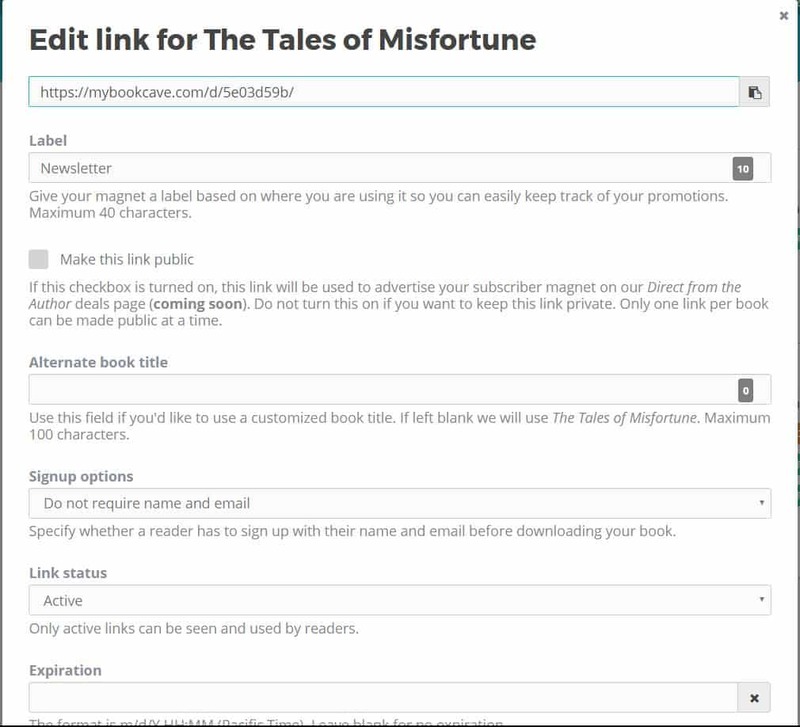 But you can have multiple links per magnet; each link can have its own set of rules. Just click the "generate link" button underneath the current link. I assume that my magnet must be formatted before it comes to you. I have the cover but am waiting until after the Thanksgiving holidays & the formatter will be open for business. Thank you.